Keeping HubSpot and Referral Rock in sync throughout your sales process is simple with Referral Rock's direct HubSpot integration. In this article, we will go over how to capture referrals and update their status using a variety of triggers in HubSpot. Use your existing online lead capture method that is already connected to HubSpot and add any referrals to Referral Rock using Referral Rock's conversion tracking script. If the user who fills out your form clicked through a referral link, the script will automatically add them to Referral Rock and match them with the member who referred them. Alternatively, you can send referrals to Referral Rock's built-in lead capture form. This form automatically attributes the correct referring member without the need for the conversion script. To ensure the lead is passed into HubSpot at the same time, Zapier can be used to create the new lead in HubSpot using the new referral trigger in Zapier. Understanding the process behind the Referral Rock and HubSpot integration is helpful when setting up your HubSpot integration settings in Referral Rock. Adding a Lead/Referral: When a new lead is captures, it needs to exist in both Referral Rock and HubSpot (see the two methods above). Close/Update Deal/Referral Processing: Update referrals based on event triggers in HubSpot. Sales Receiver: Referral Rock processes the data and makes intelligent decisions to update the referral record. The Sales Receiver will save triggers and data that it cannot automatically match. For example, if a update is sent with an email address or external identifier that doesn’t match an existing referral, the Sales Receiver will fail to update any referral. However, it will save the record so a team member can manually edit the request with correct information, if available, and rerun the Sales Receiver. 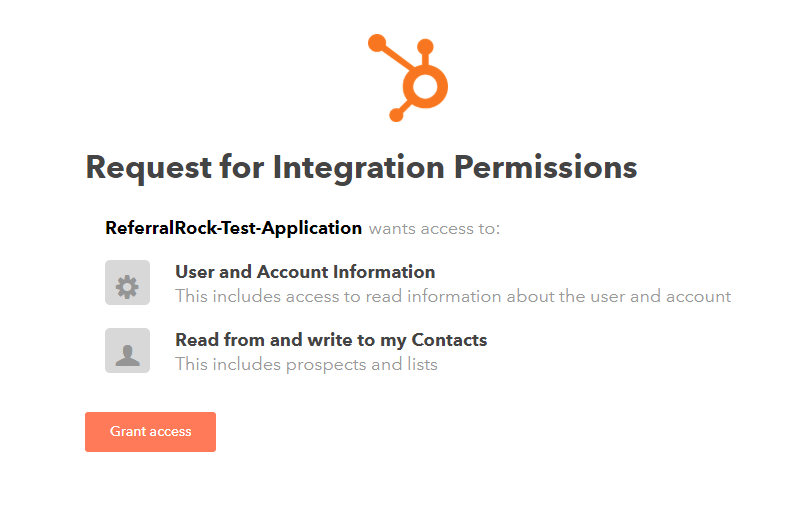 Ensure You Have Access to the HubSpot Integration: In Referral Rock, navigate to the Integration Setup page and scroll to the bottom. Connect Your HubSpot Account: Connect their HubSpot account to their Referral Rock account using OAuth. Users will be redirect to HubSpot's website where they will login and grant access so that the Referral Rock account may access data from the user's HubSpot account. The following displays the confirmation screen users will see before granting access. The "Value Match" field in Referral Rock's HubSpot Integration setup page must match the field's Internal Name (API name) and not the display name. This can be located by viewing your properties in HubSpot. Configure Settings in Referral Rock: All settings changes you’ll make will be within the Referral Rock Admin UI. Within your Referral Rock Admin UI, navigate to Settings > Integrations > HubSpot. Based on how your workflow is setup within HubSpot, you can configure the events in HubSpot to trigger updates in Referral Rock. Please go through the all of the steps on the page to configure the necessary settings. We’re happy to help talk you through the correct configuration based on your use case. This is where you select which events in HubSpot trigger referral status updates in Referral Rock. The most common update is to use the "Closed Won" dealstage of a Deal to update the associated referral's status to "Approved". Edit this to fit your sales cycle. In addition, ensure you turn off any update events you do not want to use by selecting "Not Used" under the "Object Name" for that event. If you configure this area, data from HubSpot will be used to update referral data in Referral Rock. This is generally used when you get new data in HubSpot during your sales process, and you want this data reflected in Referral Rock. The most commonly updated field is "amount", which is most often used to denote a purchase amount and which can then be used by Referral Rock to create percentage based rewards or trigger rewards for certain minimum or maximum referral purchase amounts. By default, Referral Rock will match existing referrals by referencing the HubSpot record's information. This is a fuzzy match that will look at name, email address, and/or external ID. If, however, you want more control over the way that Referral Rock matches a record, you can reference specific referral and/or member fields to Referral Rock's available matching fields. Test the setup: Trigger one of the events you setup in the previous step. You’ll be able to see the “Last HubSpot Connection” date update as well as “Last Entry Received” date if you have set everything up correctly. You’ll be able to see the “Last HubSpot Connection” date be updated as well as “Last Entry Received” date if you have your account and events setup properly but that doesn’t necessarily mean the fields are correct. If your Referral Status Change Event settings are set correctly, any tests should appear in your Sales Entries log. Also check to see if you are referencing the correct object, field name and value match. Referral Rock will only trigger an update when there is an exact value match for the selected field. Ensure that the Value Match field in Referral Rock matches the Internal Name of the property you are using as the trigger in HubSpot. If you run into any issues you can dig into the details of the individual sales entries to tell you exactly what is being sent by HubSpot. Double check your field mapping settings to see if they are indeed correct.